Some users have experienced a loss in the performance of their iOS Apple devices. The situation has even raised some sort of conspiracy theory; saying that Apple only wants to force people to get their new iOS 12 devices. Whether it is a conspiracy or not, it can be really annoying if your iPhone lags for any reason. So, here are some simple ways to make iOS run faster. Step 1: Download the free trial version of iMyFone Umate Pro and run it, then connect your slow iOS iPad/iPhone to it. Step 2: Choose the "Junk Files" option from the "1-Click Free Up Space" tab. Now click on the "Scan" button. Step 3: After the scan finished, you'll see how many junk files you can delete with Umate Pro, and you just need to click on the "Clean" button to start the cleanup and make iOS faster. Apple devices are big on aesthetics and effects that make them loved and adored by fans. These features, however, are an extra strain on your devices performance, and lead to iOS slow. To make iOS run faster, we can always optimize the Setting options. In settings, navigate to "General". Once there, scroll to, and select "Accessibility". Select "Increase contrast", and tap "Reduce Transparency" and switch to "On" by toggling. Background refresh can be burdening at times, especially when you want to play a game, or open an app that uses a lot of system's resources, meaning use too much iOS storage, and can make the iOS slow. Hence, we need to turn it off to make iOS faster. Apply the following steps to turn off background refresh. We can easily toggle between open apps on iPhone. This can often lead to apps left open for long periods even when they aren't useful anymore. These apps can make your iPad 2 slow on iOS. To close open apps, press the "home" button twice, and swipe apps that you are done using in the northern direction. Locate "Siri" and "Spotlight Search" under "General in the settings app. Toggle to "Off" in both instances. 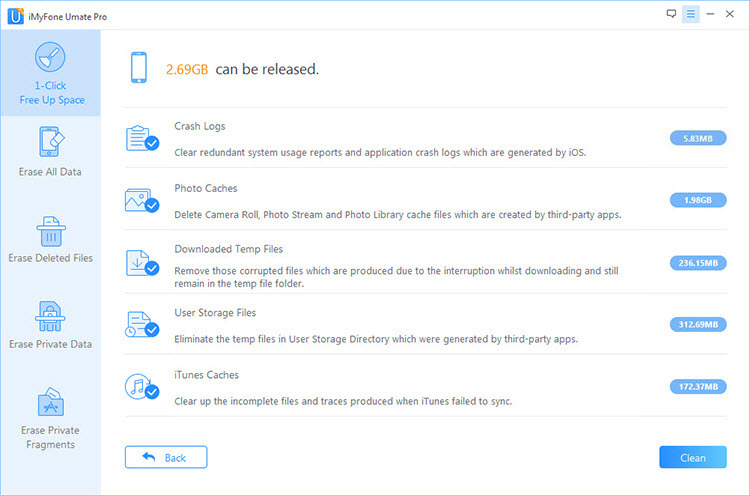 After long-time use of iPhone/iPad, the data and files we add on the devices can be rather massive, there is need to delete, manage and move such files. Improving iOS performance is one of such. Get enough free storage on iOS can greatly speed up your slow iOS iPhone/iPad/iPod Touch. Clear up junk & temporary files: Find out 30+ hidden junk files and temporary file quickly and delete all them in just 1-click. This can not be done by ourselves. Remove large file: Auto detect and list all large files over 5MB on your iOS device, you just need to preview them and delete in bulk some or all of them. Preview before deletion: Before deleting any data, you can preview them, so you won't delete important files. Transfer photos/videos to PC: For photos and videos, they take up too many storage, but maybe you do not want to lose them as they are meaningful for you. Then the best way is to delete them from iPhone but backup them on your PC. That's exactly what iMyFone Umate is doing. Compess photos: If want to keep photos on iOS device, Umate Pro give you the option to compress them, the photo compression can reclaim 75% of photo space. Manage Apps: List all Apps installed on device and sort them by file size, you can preview and remove in bulk unused Apps to release iOS space. Erase previously deleted files: Tthe files deleted in normal ways can be recovered by data recovery tool. But Umate Pro can find out all these deleted files and permanently erase them, these erased files are 100% unrecoverable! permanently erase private files: If your sensitive messages, photos. videos, call history and notes are erased by Umate Pro, then no one can recovery them, even with a recovery software. permanently erase WhatsApp: erase both current and deleted WhatsApp messages and attachments (photos, videos etc.) to avoid privacy leak. And to use this one click software, you just need run this program and connect your device. Then click on several buttons and all will be done! Once you can apply all these methods above, watch your iOS device switch from slow to snappy.